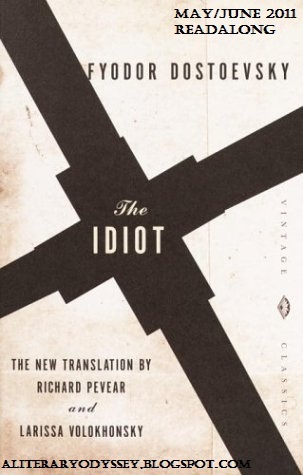 A Literary Odyssey: The Idiot Readalong Post 1 and 2: Parts 1 and 2. I'm also enjoying The Idiot! My favorite aspect of it is the characters. Great post. I share with you the opinion that the characters are what makes this novel special. It also seems more 'dialogue driven' and there's not (so far, anyway) a lot of action in it. I was struck in part I that there weren't many changes of scene over such a long span of pages. I loved the first part and I loved how the interactions and the conversations eventually built up to the climax at that party. Part two I also enjoyed but did begin to get a litle lost, I wasn't lost by the plot or characters but there did seem to be alot of arm throwing and people getting offended at I don't know what. I'll be interested to see how part three goes.